"Did you know that there’s an actual Bug Season? From March through October, roach and ant populations multiply in the hot and humid weather, causing more bug problems in homes and creating more anxiety, stress and embarrassment among Americans! 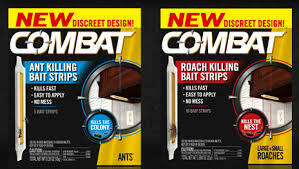 As the weather becomes warmer, Combat would like to make sure you’re prepared to defend your home against insects during Bug Season by introducing you to Combat’s Roach and Ant Killing Bait Strips. The new bait strips quietly kills roaches and ants at the source as they bring the bait back to the nest, eliminating the infestation completely. With its discreet design, the bait strips’ adhesive backing also offers versatility and can be placed out of reach of kids and pets. For more prevention tips, please visit combatbugs.com/prevention-tips." What we thought: We tried the ant baits since we usually get invaded this time of year. They worked really well and we've seen very few ants compared to what we usually see. These baits were really easy to use. We just set them behind the microwave and along the paths the ants usually take to get into the pantry. It was that simple! These baits are an easy and affordable way to curb your ant and roach invasion this bug season:) ABCD Diaries gives Combat's Bait Strips an A+!